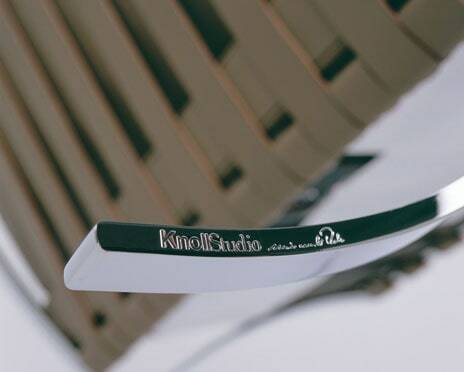 The frame of chromed, high-gloss flat spring steel is hand-polished. The upholstery consists of 40 individual elements hand sewn from a single skin. Seat and back cushions adapt to the shape of the frame. The sides and corners of the padding are dyed to the leather color. Foam covered with carefully chosen leather, individually tailored with piped seams and buttons. 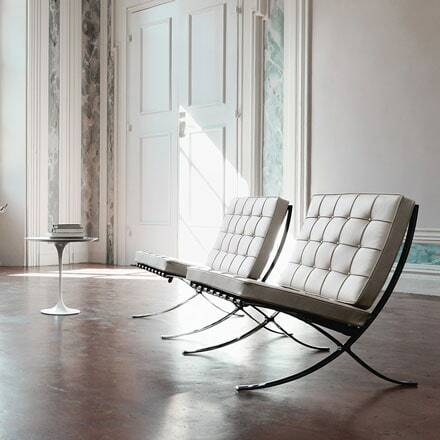 The legendary Barcelona Chair is made according to the original design by Ludwig Mies van der Rohe. The frame is made of chrome-plated, high-gloss and hand-polished flat spring steel. The cushions are hand-sewn from 40 elements and a single skin, available in various Spinneybeck leathers and attached to the frame with cowhide leather straps. The matching stool is available as an option. Each seat is unique. 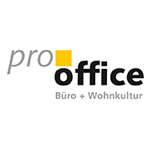 The original by Knoll, here in the prooffice shop. The Barcelona Chair is one of the most famous and iconic designs of the 20th century. In 1928 Ludwig Mies van der Rohe experimented with various seat designs. The first sketches of the Barcelona Chairs were among them. He took inspiration from classical forms such as the scissors shape that goes back to the 14th century. This form was found in Egyptian, Greek and Roman designs and stood for strong connections and power. Mies van der Rohe was particularly inspired by the cast-iron garden chair by Karl Friedrich Schinkel. Today, as a harbinger of modernity, the design served to produce cast-iron furniture in large numbers in 1825. The identical sides were forged as a unit, which gave the chair a high stability with minimal material use. Mies van der Rohe placed the axles on the sides to realize a high-cantilevered seat. This was possible only through the use of modern materials. The result was a chair of pure structure that presented the perfect combination of form and function. Originally planned for the exhibition, only two copies were designed for the Barcelona Pavilion in 1929. The free walls and levels of the pavilion should be accompanied by the form to symbolize the progressive spirit of the Weimar Republic. Mies van der Rohe said the design must be more chair and less monumental object. The chairs were fixed with the appropriate ottomans as organized elements. They were designed to stay in their place. The designer, conscious of the fact that King Alfonso XIII would be present, said the chair was fitting for a king. With this statement he made the misunderstanding clear that the Barcelona Chair was a monarchical object. 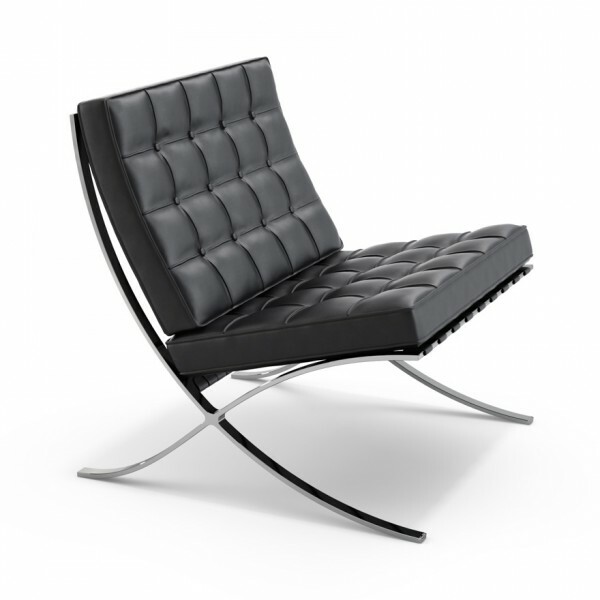 Michael Jefferson said he was not sure if there was a more unique expression for Mies' aesthetic and precision than the Barcelona Chair. 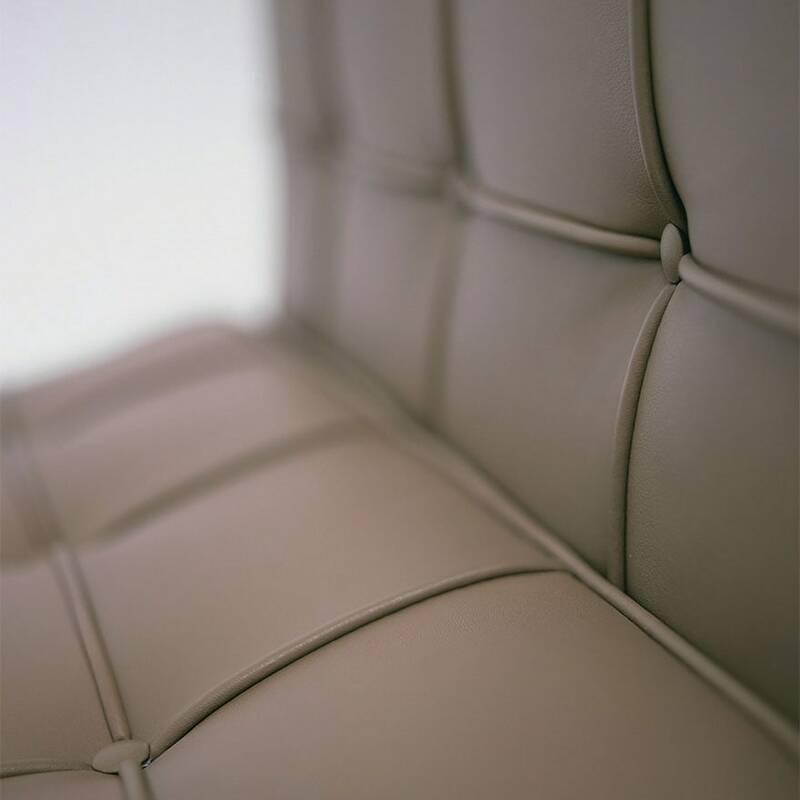 The two original models had a screwed and chromed construction with ivory leather cushions. In 1953, Knoll presented a replica of the ivory-colored chairs and handed over the chair as a gift to the Museum of Modern Art. In 1930, Philip Johnson, who met Mies van der Rohe in 1928 during his work at the Barcelona Pavilion, gave the designer the task of designing his residence. The residence was the first designed in the Bauhaus concept and brought the Barcelona Chair to America for the first time. Johnson used the furniture created by Mies for his New York apartments. Josef Müller took over the production in Berlin shortly after they were used for the Barcelona pavilion. The chairs were made by hand in the Berlin metal industry. A year later the chair appeared in a product catalog of the Bamburg Company. This was the first signal for the attempt to produce the chair in large numbers. Chrome plating was a new process in the furniture design and the company lacked enough containers to coat the one-square-meter, welded frame. This resulted in mounting with diagonally arranged screws. 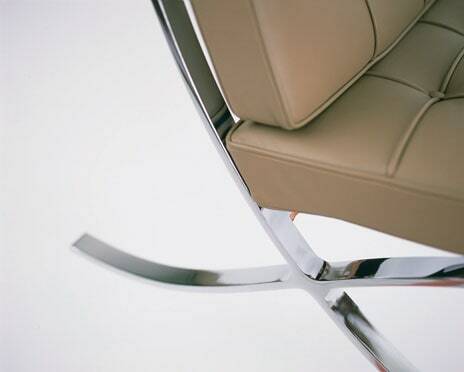 These early versions of the chair were filled like the models in the Barcelona Pavilion with Rosshaar. With the approval of Mies van der Rohe, the Bamburg Company began to make improvements to the design. The connecting points were a weak point and were moved inwards to increase the stability and durability of the construction. In 1932, the overlapping link was hidden beneath the leather straps to give the design a seamless look. In 1932, the production of the Barcelona Chair passed to Thonet, who produced the chair for another two years, until events which were to lead to the Second World War brought production to a standstill. In 1938 Mies van der Rohe from Germany, fled his place in Chicago and became director of the Illinois Institute of Technology. 1945 - Florence Knoll and Knoll, Inc. In his time at the Institute of Technology, the designer was moved by the former student Florence Knoll in 1945 to offer his entire furniture collection in large quantities for America and the international market. As a mentor of Florence Knoll, he decided to give Knoll, Inc. the rights to the production. The company tried to experiment with the construction of a prototype with aluminum, but the material change brought some problems. Knoll decided not to use aluminum in favor of chromium plating. In the transition period from 1945 to 1947, the company Titlegratz took over the production of the Barcelona Chair in New York. Selected examples from this period can be found in various Philip Johnson interiors. Knoll began production in 1947. The chrome-plated models were produced outside of the plants in East Greenville, Pennsylvania. The most striking feature of a Knoll made Barcelona chair are the thick, folded pipelines with the pillows filled with industrial foam. In 1960, the first Chicago-made models appeared. These were made of stainless steel for the first time. Metal worker Jerry Griffith was responsible for the production. He sacrificed an element of durability to add more elegance to the distinctive wrist. This is visible by the missing welding seams. This design took its place in many buildings designed by Mies in Chicago. Following the idea of Griffith, Knoll changed his production to stainless steel in 1964. Mies announced that he would have chosen this material from the outset if this technology had been available to him. After the death of Ludwig Mies van der Rohe, Knoll 1969 produced bronze coated models for special commissions, especially in the middle west. The demand for the Barcelona chairs in bronze was high, especially in Chicago. As with any great design, there is the temptation to copy this. In the case of the Barcelona Chair, this is extremely much the case. Since the mid-90s, Knoll has added Mies' signature on the back right leg to distinguish the Barcelona Chair from the versions on the market. Related links to "Barcelona Chair"
Customer evaluation for "Barcelona Chair"